Simplicity is important, now any container can easily share data with other containers across clustered environments. It helps to build highly scalable applications by keeping persistent data available for all services from a shared storage. 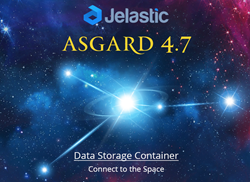 Jelastic, turnkey PaaS and CaaS solution with Docker containers integration, announced the latest release, named Jelastic Asgard 4.7, that provides support of a certified Data Storage Container. The feature guarantees a number of significant benefits, aimed to improve data handling by sharing it within clustered environments that are scaled horizontally, as well as to optimize the disk space consumption to decrease the spends. "It is great to see how fast the platform is improving and how development embraces very useful new features for users to setup different hosting solutions. With separated storage containers and different mounting options we can provide our customers new ways to store and use their data, giving them more possibilities to run and maintain their application landscape," said Neven Dogovic, Product Owner Hostnet. "Thanks to the Asgard 4.7, a new version of Jelastic Platform, environments setting and management become even easier! As for the Data Storage Container, one of the most important features available in this version, is the option to have a dedicated container only for volume data management, which solves the problem of the duplicated content between nodes that provide the same service," said Marco Zani, neen CEO. The introduced solution is applicable to all the Jelastic certified containers, as well as to custom Docker images, where such integration is implemented based on volumes functionality. The process is completely automated by the Jelastic PaaS, so you only need to add a mount point through the corresponding form - file manager or Docker volumes configuration section. The further required operations will be done by platform automatically. In such a way, any container at Jelastic can be easily treated as either storage or client upon the necessity.